In one of the most horrific transit bus accidents in U.S. history we see what is left of a 1940 36 passenger Yellow Coach modeled as a TG-3603 and numbered somewhere between 4900 and 4980 belonging to St. Louis Public Service Co. (SLPS) of St. Louis, Missouri. The tragedy, which occurred on December 26th. 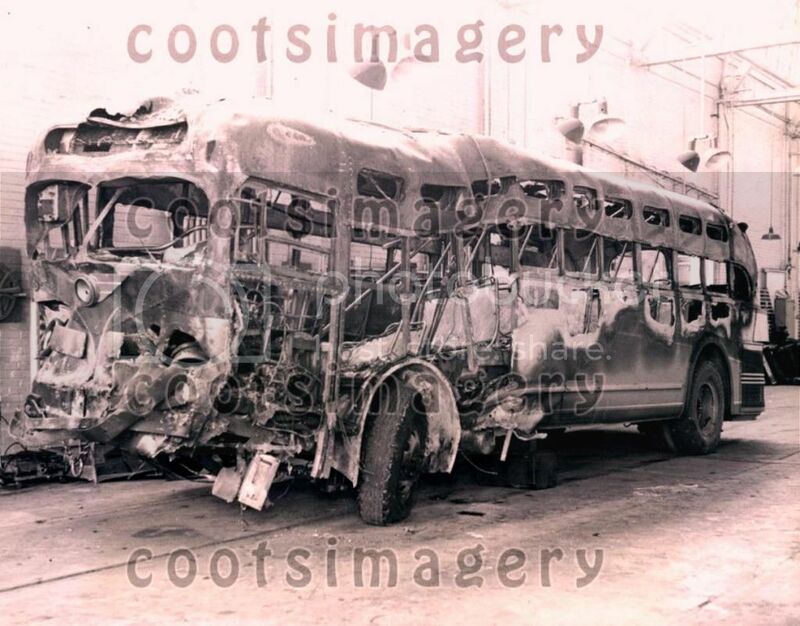 1941, began with a collision with an automobile that caused the bus to careen out of control smashing into a brick wall and bursting into flames killing 10 passengers and sending 21 more to the hospital (no indication as to the disposition of the bus driver). Investigators believed that the explosion was caused by an improperly placed gasoline tank under the bus. The Yellow TG-3603 was designed by and built exclusively for SLPS to resemble as closely as possible their fleet of PCC cars with special wind up windows and customized front clips including the first 'Old Look' use of an angled windshields that Yellow liked enough to adopt as a standard. Photo courtesy of 'cootsimagery' and is available at eBay as item # 420656730043.